Posted January 20th, 2018 by Mobile Music School & filed under Music Lessons, Recorder Lessons. 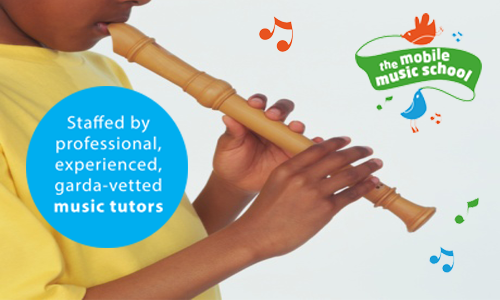 Our Classroom Music programmes run over the course of the school year and consist of between 24 and 34 weeks of tuition. We offer a variety of music workshops and lessons to primary schools, ranging from curriculum based classes to instrument projects. Set on the three core strands of the primary school music curriculum, these music lessons focus on listening and responding, performing, and composing. Our music programmes for primary schools ensure that the world of music is explored in a fun, calm and structured manner. We also offer our range of classroom music programmes as Gaeilge. To visit the Gaeilge version of our website, please click here. Our weekly recorder lessons with the students of Portlaoise ETNS are showing great progress. Classes have worked in groups to create their own performance of the pieces they have been learning in class, with each group featuring some percussion players and a conductor. The groups did a great job performing their arrangements for the class. In the run up to Christmas, our recorder classes focused on learning ‘Winter Joy’. Students were put into groups and created an accompaniment line using percussion, with a conductor in each group. Each group performed the piece for the class led by their conductor at the end of session. Auditions also took place for the school band, which will be starting up this January! Our ‘Learn & Explore’ music programme sees junior to 1st class focusing on Irish music. The groups sang ‘Mé Féin’ and are listening to examples of Irish music. Our students even learned about the tin whistle and some Irish dancing too! To learn more about our Music in the Classroom programmes for schools, please see our Classroom Music page. If one of our music programmes if of interest to you, please contact us to discuss what we can do for you in further detail.